There are several reasons why golf is so difficult. One is that the ball being on the ground, and not in the air, means the club has to brush the ground at a precise spot to achieve good contact. Then there is the tilt of the body. A baseball swing is pretty easy, because the shoulders and hips rotate in parallel planes. In the golf swing, the planes are not parallel, and swing theory is born. Let’s not forget the ball itself, which is pretty small. Hitting it with a small clubhead at high speed is no mean feat. But there’s one other thing about the golf swing that can linger even when these physical problems have been conquered. The notion of trust. As long as I’ve been playing golf, it’s still hard for me to believe that if I do just a few simple movements correctly, and rely on then to work, they do. Let me describe the swing in such a way that no one deciding whether to take up the game would even want to try. You set the clubhead behind the ball. Then you swing it away so the the club goes way over your head. The clubface is now upside down, and facing in a completely different direction. Your body is all wound up, too. Now you unwind all this, swing the club back down at an accelerating speed, so the clubhead sweeps through the ball at just the right height, makes contact on just the right place on the clubhead, which will be square to the direction you want the ball to go, like it was when you started. When you consider it for a moment, you might wonder how that can possibly work. There’s really only one thing to do after your mechanics have been ironed out — trust that the swing will work. By “the swing” I mean THE golf swing, not your particular one. You have to trust that if you stand to the side of the ball, wind up then unwind, it will work. So many errors arise in our swing because we don’t believe that will work, and we think we have to DO something — we have to add something to that technique — just to be able to hit the ball. There are three stages to go through. Stage 1 – you consciously have to apply technique to be able to hit the ball. I’m there some of the time. Stage 2 – you don’t worry about your technique, but are still getting comfortable with the idea that swinging back and through actually works. I’m there most of the time. Stage 3 – the swing is just the means of getting the ball to go where you want it to go. I’m there maybe one time per round. I’m not going to say you have to warm up before a round in order to play well. I’ve warmed up and played indifferently. I’ve also gone straight to the first tee, took a few swings to get loose, and shot even par. But in general, you’ll play better if you warm up first, and better still if you warm up correctly. There’s more to it than just beating balls. A lot more. It certainly helps to hit a few balls just to get relaxed, loose, and, well, warmed up. Literally. Move your muscles around by swinging the club lightly, even like a baseball bat at first, enough times for your muscles to actually heat up a bit. As you get older, this becomes more important for preventing injuries. You want to hit a few balls to remember how your swing works. Much of the time, the first four or five balls I hit make it look like I picked up a golf club for the first time last week. Then everything falls in place and I have my swing back. I would rather hit my clinkers on the range than on the first few tees and fairways. I like to hit one shot with every club. I don’t want to have to hit my 8-iron for the first time on the fifth hole. I would rather already have made friends with it that day. Are there special shots you need to hit on this course? A tee shot around a corner? and approach over a tree? Rehearse them on the practice tee. But let’s get down to subtle things that will make a big difference. Find the tempo you will use today. Find the tempo that lets you swing as fast as you can without feeling like you’re forcing it, and lets you maintain your 3:1 swing rhythm. It might be a little faster, or a little slower than you think you normally use. That’s OK. It’s your tempo for today. Then move on to ball position. You’re looking for the low point of your swing, so you can set up with the ball an inch or so behind. Move the ball back and forth between shots to find the position where you get the most solid strike. Next, practice your aim. You don’t have to hit any balls to do this. Set yourself up to some marker downrange with a club or an alignment stick behind your heels. Reach back with your clubhead and pull the stick against your heels. Now step out of your stance and see if the stick/club is aligned parallel left of where you were aiming. Keep setting up to different targets until your sense of aim is spot on. Pull a ball over, set up, look downrange, hit the ball, watch it for a bit, pull over another ball, set up, hit it, watch it for a second or two, pull over another ball, and so on. What they do is take their time. They take their time. They pull over a ball, take their time getting set up and aimed, hit it, and watch it until it lands. Then they’ll take a few practice swings, or practice a swing movement, and without being in any hurry, drag one over, take their time getting set up, hit it, watch it, and so on. They’re practicing being deliberate when they have a shot to make. They’re not practicing to take five and half yours to get around the course, but not to be in a rush when it’s time to hit. If warm-up like this, and get clear on tempo, ball position, aim, and deliberation, you will, on the whole, play as well as you can much more often. I have a 9 handicap. Good, not great, but it is a level most recreational golfers would love to attain. Let me tell you what skills I learned that got me there. They’re skills you can learn, too. I swing the club with a strict 3:1 rhythm at a tempo that suits my swing. My hands are ahead of the clubhead through impact. I play a gentle fade. Most of the time you would have to stand behind me to be aware it. I have combinations of clubs and swing lengths that let me pitch the ball close from 50-100 yards away. I have a combination of clubs that let me chip very close from just off the green regardless of the distance. I developed physical calibration of my approach putting stroke to get the ball close, from 45 feet and under. I don’t get upset when I hit a poor shot. I just walk to my ball and start thinking about how to make the best out of the shot I’m facing now. After a few holes, what my score is stops coming to mind. I don’t know what it is until I write it down after the round is over. Learning these mental skills is described fully in my book, The Golfing Self. Of course there is more to good golf than these nine points. But if they are part of your game, par should be a reasonable expectation on all but a few holes of the courses you play. These are a few things you must be able to do to call yourself a golfer. How many of them do you KNOW how to do? There’s more, but this is a good enough start. You can add others on your owns you discover them. How do you learn to do these things? Well, you don’t learn by trying to figure it out yourself. I have posts on most of them, but the best way is to get a lesson. Have a pro show you how, and take notes. Then practice. You want to get to the point where the course cannot give you a problem you don’t already have a solution for. From time to time, you read about, or someone you know might say, that a golf course is a waste of the space it lies on. 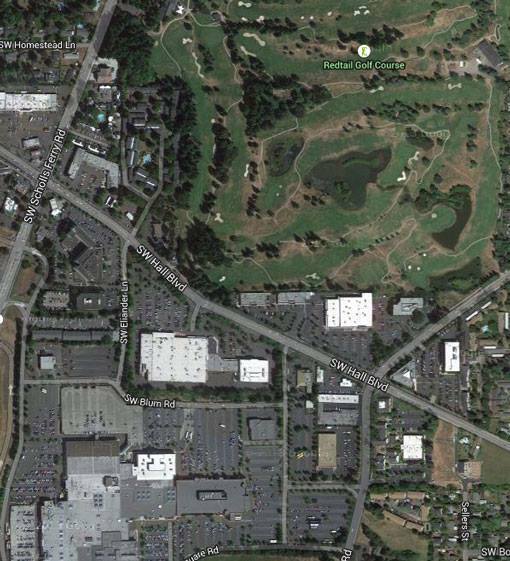 The picture below is of the RedTail Golf Course in Beaverton, Oregon (back nine), which is next to Washington Square, a large shopping mall. Which one do you think is the best use of the land it lies on?